Last month, Warner Bros. Interactive Entertainment announced that iconic characters such as Leatherface from The Texas Chainsaw Massacre horror film series and the Xenomorph from the classic sci-fi horror film franchise Alien will be playable characters in Mortal Kombat X's Kombat Pack 2 as downloadable content (DLC), arriving in the first quarter of 2016. Today, the studio has released a gameplay trailer offering a look at these new characters in action. The trailer also showcases other new characters such as Tri-Borg, a new version of Kombatants Cyrax, Sektor and Robot Smoke and Bo Rai Cho, master of the drunken fist. Mortal Kombat X is NetherRealm Studios' most recent installment in its legendary, critically acclaimed fighting game franchise that propels the iconic franchise into a new generation. The video game combines cinematic presentation with all new gameplay to deliver the most brutal Kombat experience ever, offering a new fully-connected experience that launches players into a persistent online contest where every fight matters in a global battle for supremacy. 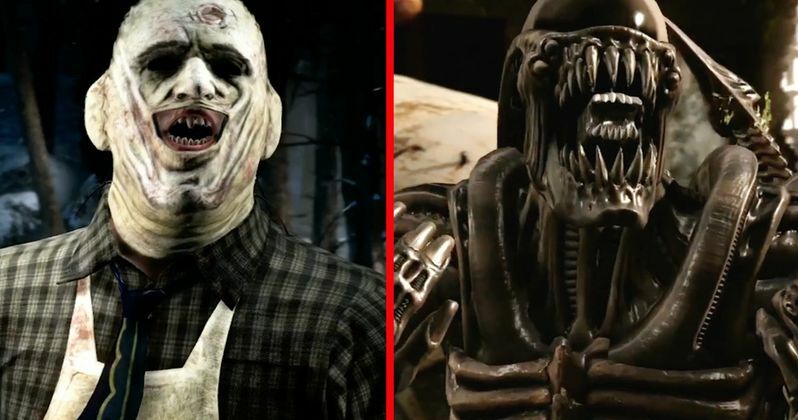 Leatherface and the Xenomorph aren't the first movie characters to be introduced in Mortal Kombat X. The first DLC included Predator and Jason Voorhees, along with Tanya and Tremor. It isn't known how much Kombat Pack #2 will cost, but the first DLC was priced at $30. We also don't know how many Kombat Packs Warner Bros. Interactive Entertainment plans on releasing for this hit game, or what other beloved characters will be introduced, but fans who order this DLC will also receive a few more supplements as well. Players who purchase Kombat Pack 2 will also receive the never-before-released Apocalypse Pack, as well as The Brazil Pack, Kold War Pack and Kold War Scorpion skin for Mortal Kombat X. Goro, the feral, four-armed Shokan warrior will also be available as a playable combatant. The Apocalypse Pack features three new character skins, reimagining characters Takeda, D'Vorah and Erron Black with an apocalyptic theme. The Brazil Pack features three new character skins: Futbol Cage, Capoeira Liu Kang and Gaucho Kung Lao, while the Kold War Pack includes three new character skins: Motherland Sonya, Tundra Sub-Zero and Revolution Kano. Take a look at this new gameplay trailer for Mortal Kombat X, and stay tuned for more on these DLC packs.